Show holds many opportunities for beefing up herds with high-quality heifers. 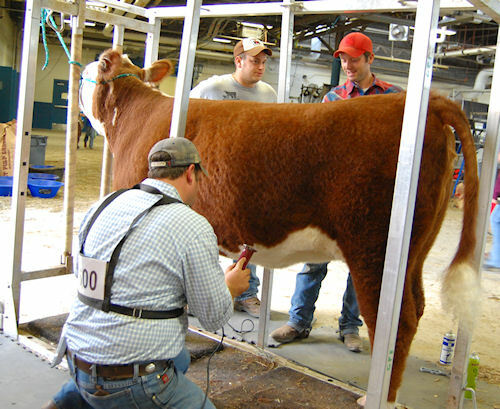 The 2011 Keystone International Livestock Exposition will host the first ever all-breed Heifer Showcase Sale on Saturday, Oct. 8, at 3 p.m. KILE runs Oct. 1-9 at the Pennsylvania Farm Show Complex and Expo Center in Harrisburg. The largest livestock show on the East Coast features 1,200 beef cattle, 700 horses, 1,100 sheep and 1,100 swine from more than 25 states and Canada. DRESSING UP: Exhibitors at the 2010 KILE fit a heifer for show ring competition. Consignors will be a member of their respective state breed associations and must be a member of the Pennsylvania Livestock Association. All consignments will be registered purebred or registered percentage heifers recognized by and registered with a breed association. They also needed to be entered for KILE competition by Sept. 1. Sale animals will also have valid, current registration papers issued by breed association with ability to be transferred. If a transferable registration paper isn't presented at check-in, the heifers won't be eligible to sell. Health charts comply with interstate shipping requirements. Each sale heifer will have a separate health chart (or copy). Pedigrees, footnotes and pictures will be cataloged and published on KILE website, www.keystoneinternational.state.pa.us. Lot numbers will be assigned by breed and age. A hard copy with pedigree and footnotes will be sent on request only. KILE will handle all transfers, and the sale order will be determined by the Keystone Heifer Showcase Sale Committee. Each Pennsylvania state breed association or the association representing Pennsylvania at the sale will receive 1% of the gross revenue of their breeds' cattle. For more KILE information, visit the above noted website. Or contact the KILE livestock office at 717-787-2905, or sale committee member Frank Stoltzfus at 717-371-0798.